For all the disbelievers in outdoor dining in Manhattan, here are some arguments to savor. NEW YORK (TheStreet) -- Spring is here and with that the desire to dine outdoors. But outdoors in New York City, with all the traffic, exhaust and passers-by? For all the skeptics out there, TravelsinTaste has sought out the latest in outdoor dining to check out while visiting the Big Apple or simply trying to lose oneself in the moment. 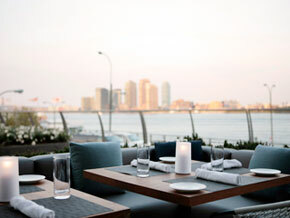 Tom Colicchio's Patio at Riverpark offers sweeping views of the East River. Riverpark, the newest restaurant from Bravo's notorious Top Chef judge Tom Colicchio (and owner of the Craft restaurants, Craft, 'wichcraft and Craftsteak in addition to Colicchio & Sons), has debuted its 44-seat patio with breathtaking views of the East River at its East 29th Street location. Later in the summer the restaurant plans to open an adjacent terrace with reclining chairs and music. Guests at both will be able to savor Executive Chef Sisha Ortuzar's flavorful modern American cuisine while sipping refreshing, inventive cocktails such as The Last Word, created with Plymouth gin, maraschino liqueur, Green Chartreuse and lime. Colicchio certainly knows how to get the party started. Recently opened David Burke Garden at The James New York on Grand Street at Sixth Avenue is an unparalleled outdoor space with its own bar and seating for 130. Horticulturalist Rebecca Cole landscaped it and the hotel's garden with herb beds and flowers in addition to sculptures made of recycled materials reflecting the rustic, whimsical vibe. A 14-seat open-air chef's table and private cabanas are just the start of luxury in this oasis. With Burke, also owner of the ever popular davidburke townhouse, one expects the unexpected; his cuisine is as whimsical as the space. Starters include tuna tartare tacos with whipped avocado and tomato gazpacho with watermelon and rock shrimp, while entrees include the soft-shell crab with salted mango puree, pickled vegetables and Old Bay. Adding to the whimsy, the bar will serve luscious libations in addition to nonalcoholic sun-brewed iced tea in oversized glass jugs showcasing the exotic flavors of spring and summer, such as Meyer lemon, hibiscus and ginger-peach. David Burke understands New Yorker's desires for open-air dining; the patio of his seafood restaurant, Fishtail, has seating for 25 and a retractable roof. His signature tower of shellfish is a perfect complement there. A true escape from the city is The Trilby's garden at the Cooper Square Hotel, which continues the casual hangout's inviting atmosphere into the outdoors. In the garden, guests can refresh and revive with creative cocktails such as the Cowboy Martini (made with gin, fresh mint & lemon juice), while snacking on no muss, no fuss oysters and cheese & charcuterie plates. Games are even available to round out the casual vibe. Marche De Sud's garden on the Upper East Side is a perfect place for an evening get-together with friends from the neighborhood. Co-owners and noted chefs Adil Fawzi and Anthony Raggiri prepare their fabulous creations, including the dish that everyone's talking about: their tarte flambees, a very elegant, thin-crust pizza with just the right French touch! It is the perfect light bite to share or devour on your own with a glass of wine from this happening wine bar while contemplating the lush greenery in the midst of the urban jungle. A wonderful respite in the midst of Midtown is the rooftop at Aretsky's Patroon. To get there, you'll make your way upstairs past framed snippets of discussions of liquor from "The Zodiac of Wines," which determines that cider and sparkling burgundy are like Libras. The bar, along with its flat-screen televisions and Japanese lanterns, provides just the right sense of fun and frolic. Check out the lush foliage on the patio, which hangs over the ledge to 46th Street. Open seasonally through mid-October, the rooftop space is heated in anticipation of chilly evenings and provides the perfect escape from bustling Midtown. It's more casual than the restaurant and great for a drink or a light bite of shrimp cocktail or Angus prime beef sliders.